If you answered YES to even one of the questions on the right than personalized training is for you. Training for a marathon or a half marathon is too big of a challenge to undertake and leave to chance by using a training plan that is trying to meet everyone's needs. A personalized training package that includes your marathon training plan based off of your needs, fitness level, and if striving for a time goal, personalized training paces. Extra information\guide on whatever you want to focus on/work on during this marathon - weight loss, strength, endurance, motivation, nutrition, etc. Email support/check in 2 weeks before your scheduled marathon that will include any personalized carbo-loading information that you might need before your marathon and a guide on developing your mental training strategy for during the race. Email support/check in with a recovery packet for after the marathon. A whole lot of wonderful memories, self-worth, and confidence! Why is Custom Training the Best Option for You? 1. It saves time! You will save time knowing that you have a training plan designed to fit your body, your needs, your goals. You wont have to dig and research and find multiple plans and then try and sort out which one is the right one for. You only have to fill out a profile and your plan will tailored for you. 2. It will help prevent injuries. If a training plan is too aggressive for you, you risk incurring an injury. In fact that is one of the number one reasons that people find themself injured. They take on too much, too soon. With a custom plan, you don't need to worry about whether you are doing too much. The plan will take into account your running history, fitness level and previous injuries and lifestyle to make sure that you are training at the right level. 3. It works with your schedule. We all lead busy lives. 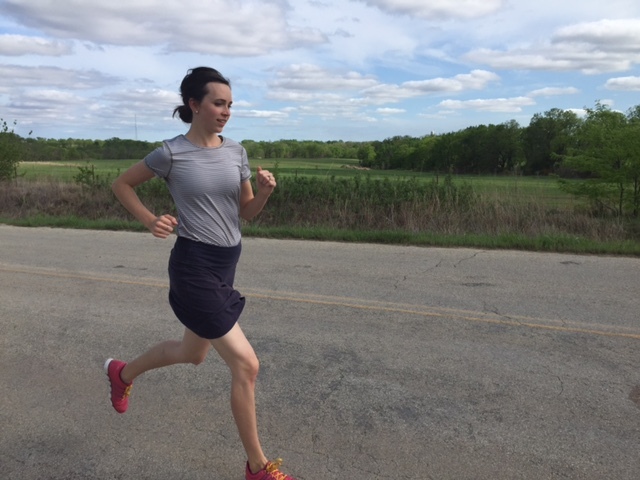 Everyone's schedule is a little hectic at times and juggling a training plan to fit directly into your life can leave any runner feeling stretched too thin. 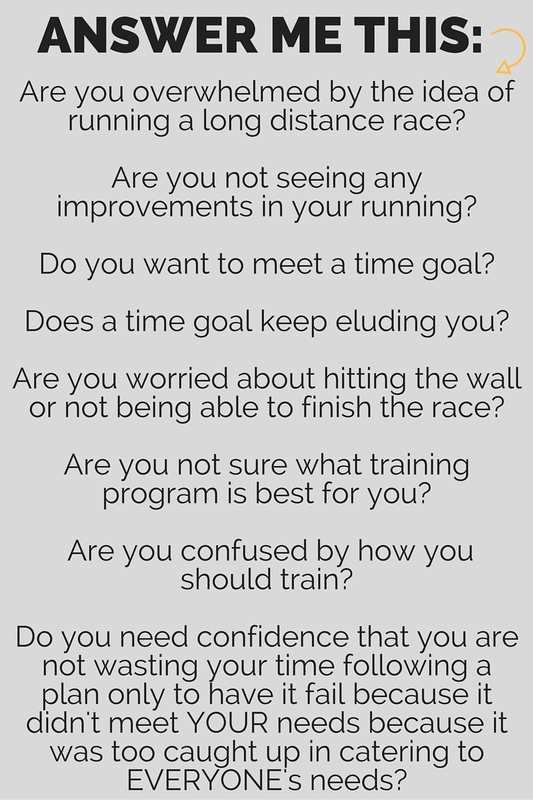 Custom training plans however schedule your runs, long runs, cross training, etc. to fit into your day to day life, on days when you can handle it. Another Bonus: having your runs fit into your schedule will make it much more likely that you will keep up with your training and have a successful race. It is all mapped out for you, you just have to do it. 4. It works with your goals. Most generic plans are designed to get the runner to the finish line. Not just one runner but thousands of runners. Everyone knows that no two people are the same. Their goals, dreams, hopes, visions, are all unique to them. What they want out of a race can only be expressed by them. How can one training plan give everyone what they are looking for? It simply cannot. Custom training though can. It is centered around each runners goal. The core of the plan is designed around what each runner is hoping to gain through the training and the race. Why Trust Me With Your Training? I have been running for over 10 years. With 6 marathons under my shoes and numerous races of a variety of distances, it’s my first love. I couldn’t stop at the finish line though and so I majored in Kinesiology with a focus in Exercise Science. With courses in biomechanics, training periodization, anatomical kinesiology, sports nutrition and a host of others including a cardiac rehab internship, I have made running not only my passion but my job. So How Exactly Does Custom Training Work? How does it work? What do you need to do now? It's three easy steps to get your personal plan. Step 1: Fill out the profile form that is linked below and submit it. This will help me understand your goals, running history, what you want out of the race, what kind of training plan you are looking for, etc. Step 2: Wait for me to email you. I will review your profile and goals, make sure we are a good fit for each other and then I will email you within 24 hours if it is during the week, or the next business day if it is the weekend. Step 3: After you receive my email, I will start working on your personalized training plan as soon as your payment clears. Allow 3 weekdays to receive your personalized training plan along with a full explanation of how it was designed. Follow up with any questions and support that you may need. The goal is to give you a training plan that works for you and makes YOU successful while having a wonderful racing experience. So are you ready to start on this adventure? I would be honored to work with you and get you race ready with a plan that can only work for you. If you have any questions or requests that you want to add/take away just Email Me or leave a comment below! Select your option and fill out the profile. Once payment is received you will get your program within 3 business days. My Guarantee: If after receiving your plan you feel that your goals and needs were not met, a 100% full refund, no questions asked, return policy will be honored.